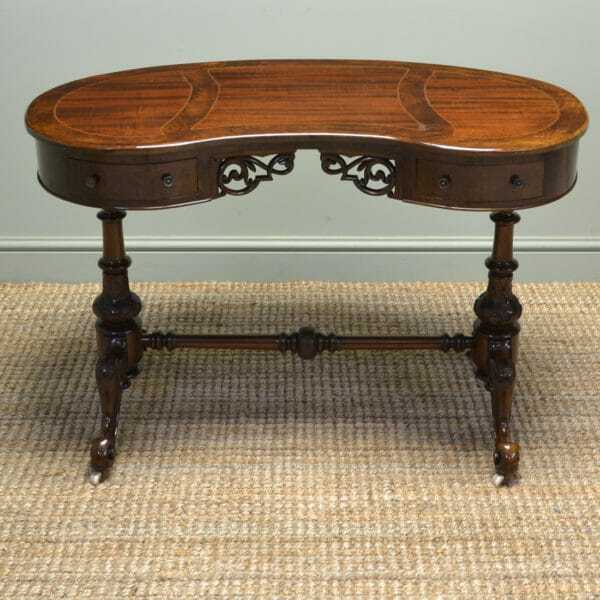 Antique Kidney Shaped Tables or Kidney Shaped Desks, were unusual pieces of antique furniture and only built by a skilled Cabinet maker of the Victorian and Edwardian periods as it was such a difficult shape to make. 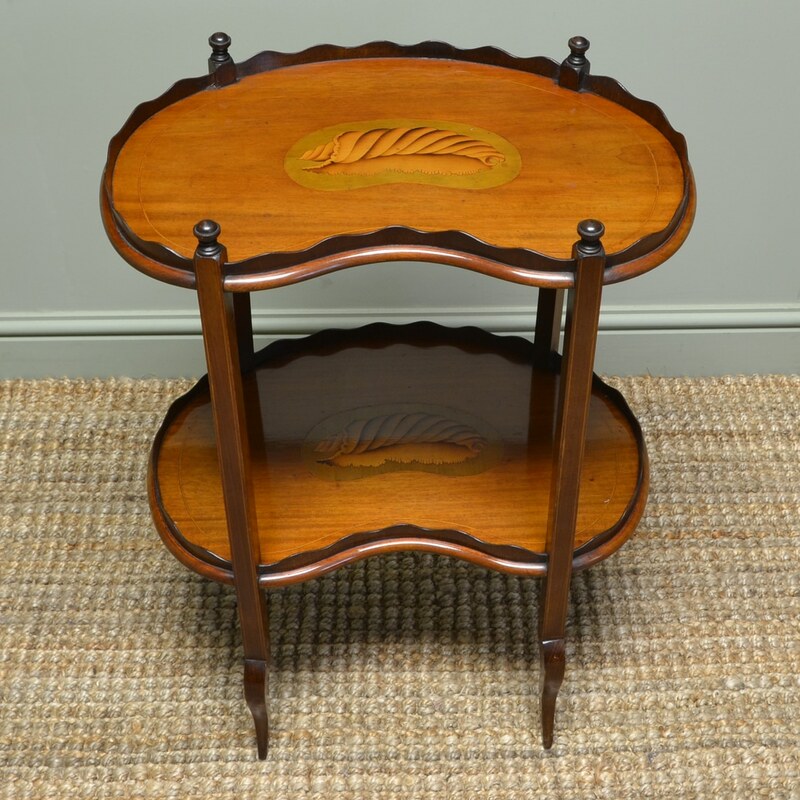 These shapely tables were usually used as a dressing table or writing table often with a leather top and built by some of the most renowned cabinet makers like Maple and Co or Gillows. The woods used to construct them were mainly Mahogany, Satinwood and Walnut, occasionally with pretty floral inlay as decoration. The brass handles and locks are always of the finest quality, as these pieces were only built for the wealthy client, so no expense was spared in their construction. Have a look below at our lovely examples available for sale. 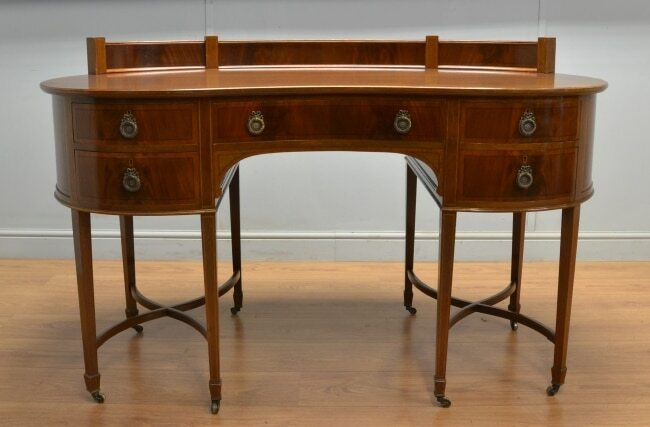 Fine Quality Edwardian Figured Mahogany Kidney Shaped Antique Writing Desk. 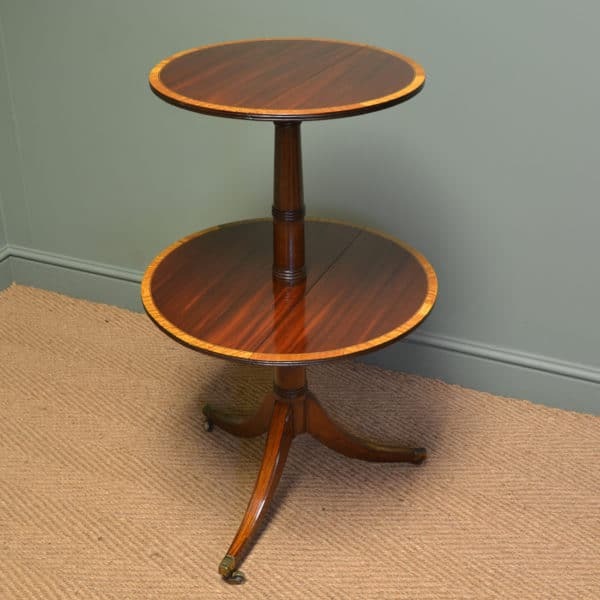 below are some more examples of antique kidney shaped tables that we have sold. we do get some beautiful examples in stock, so let us know if you are looking for one and we can try to find you something suitable. 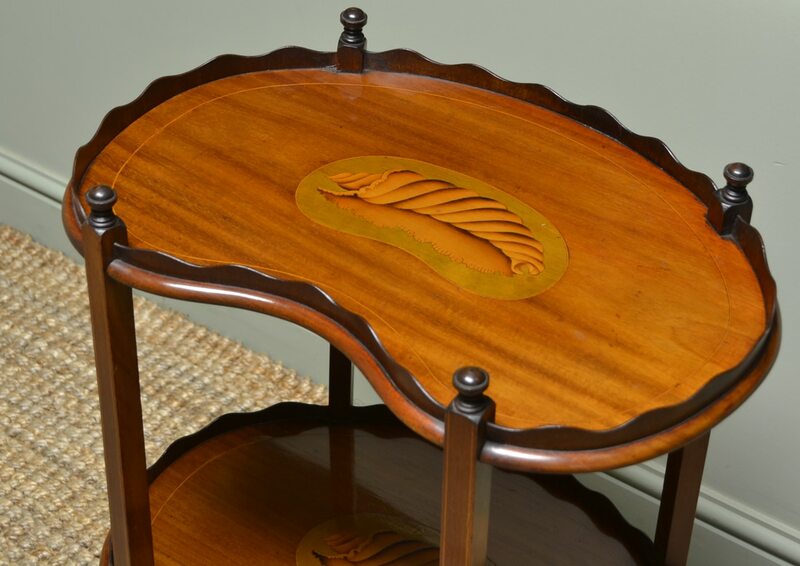 This Fine Edwardian Mahogany Occasional Table with Shell Inlay dates from around 1900 and has two kidney shaped moulded tops with spectacular shell inlay centres. 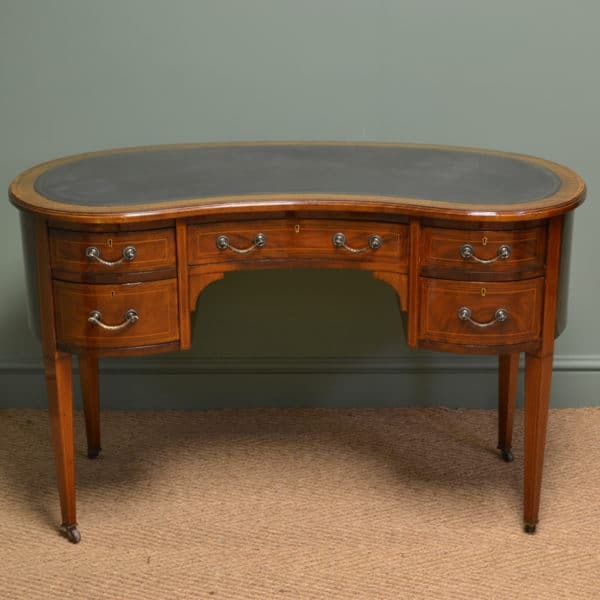 Superb Quality Mahogany Antique Edwardian Kidney Shaped Desk – T.B.& W. Cochayne of Sheffield. 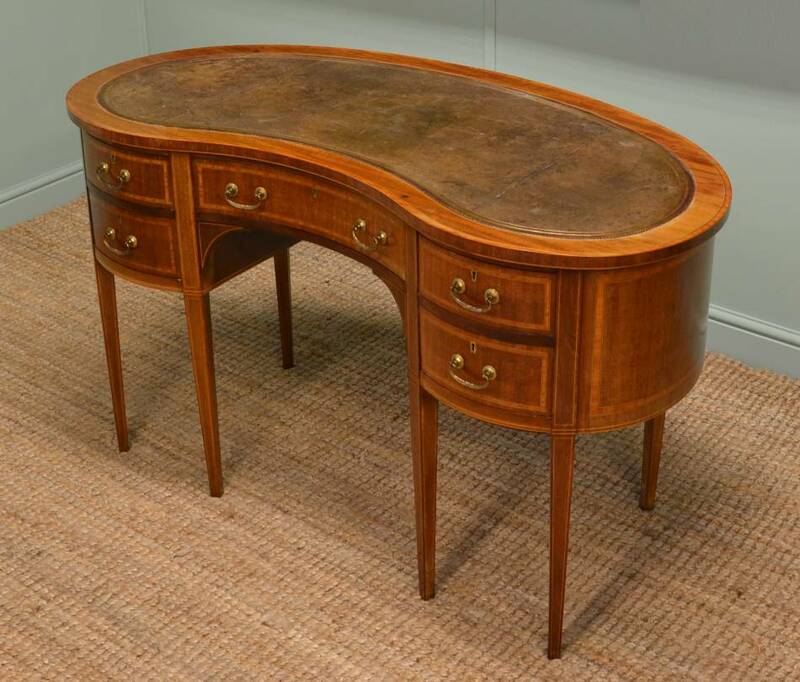 This mahogany kidney shaped antique desk dates from the Edwardian period, circa 1900, and is of the highest quality made by T. B. & W. Cochayne of Sheffield. Originally opened as a draper’s shop in 1829, T. B. & W. Cochayne expanded to become a large department store, with its own cabinet making factory. Its premises were eventually destroyed, along with many of the company records in the Sheffield Blitz of 1940. This particular desk crafted by them has a raised curved back above a beautifully figured kidney shaped top with ebony string inlay and moulded edge. 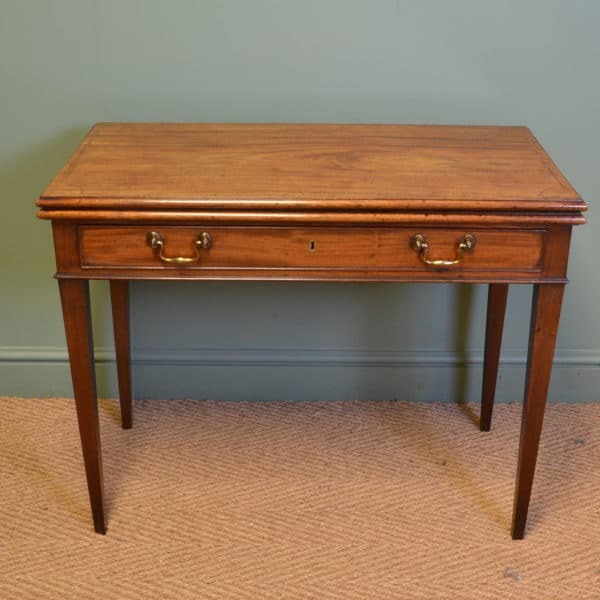 It has a central drawer over knee hole and two smaller drawers, all beautifully shaped, mahogany lined and with the original brass handles. 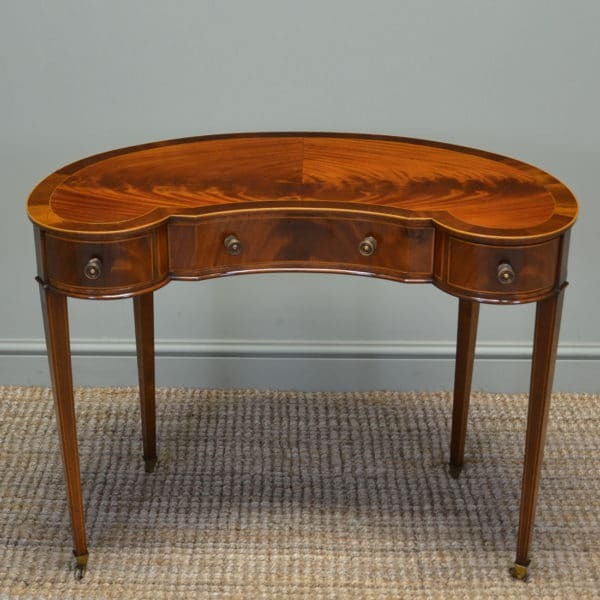 The figuring of the mahogany all over the piece is wonderful. The antique desk stands on eight tapering legs with brass castors and has unusual and delightful ‘X’ shaped cross stretchers. 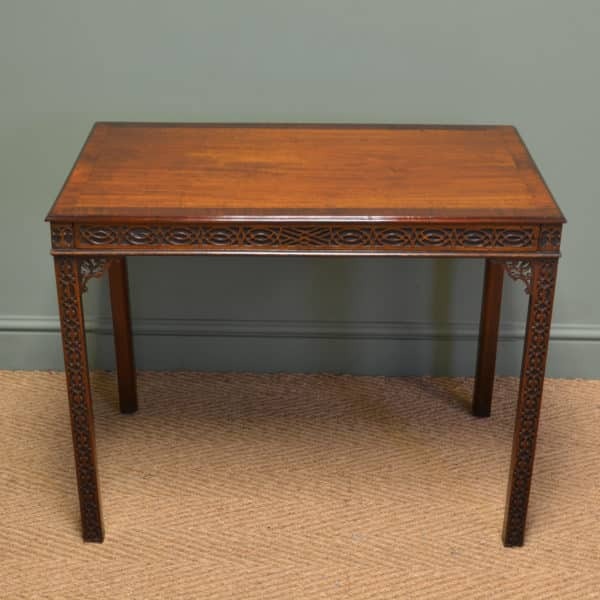 Quality Edwardian Inlaid Mahogany Antique Kidney Shaped Desk. 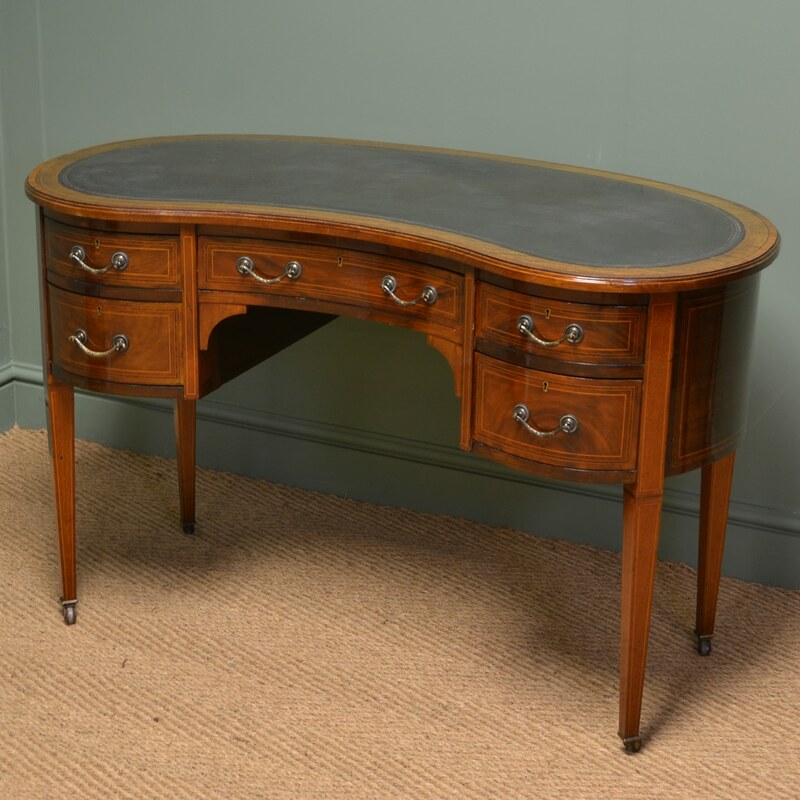 This kidney shaped desk is a very unusual find, dating from around 1900, it is a superb quality piece from the Edwardian period with inlaid mahogany. It has a kidney shaped top with tooled leather writing insert above several drawers. The central concave drawer is flanked by four smaller bow fronted drawers, all mahogany lined, and with original brass handles. The antique desk stands on six tapering legs, and has an overall look of elegance enhanced by the beautiful satinwood cross banding with boxwood and ebony string inlay. It is a superb quality piece with the added uniqueness that the kidney shape has to offer. We'd like to say a big thank you for the wonderful dining table and chairs that arrived this morning, and also for the great care shown in depositing them safely in our sitting room. We are extremely happy with the items and the service, and look forward to more purchases in the future.